To begin, we will need to tape down a piece of wax paper to a flat surface - I used a serving tray so my icicles could easily be moved and set in a safe place to dry. 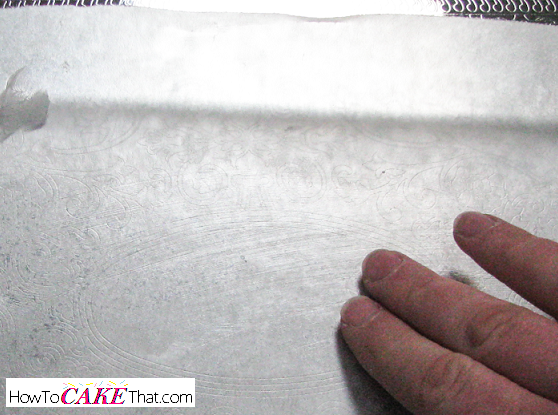 Next, use shortening to lightly grease the wax paper. Be sure to completely cover the area where you will be piping your icicles. The shortening will keep them from sticking to the paper. NOTE: The icicles in the photo are small, and I have not yet tried to make these icicles in a large size. 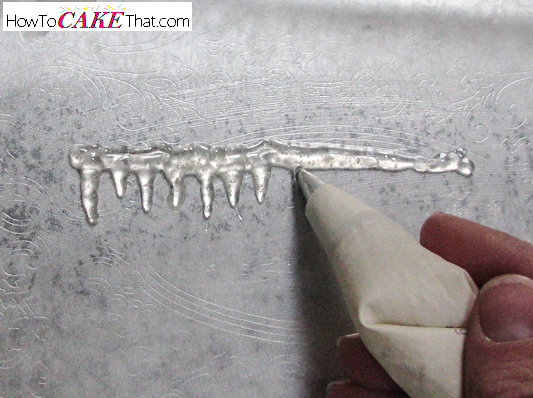 Therefore I do not know if large piping gel icicles would work using this method. 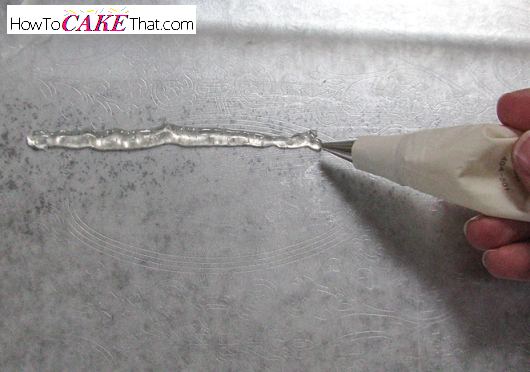 Next, place the pastry tip on the piping gel line and gently squeeze and pull down to form little icicles. Allow icicles to dry for several days. Your icicles will be ready to use when the surface of the icicles are dry (not sticky) to the touch and have a slightly firm rubbery feel. The icicles in the photo took about 3 days to dry enough to use (These icicles were made in the winter when the air is cool and very dry. If your climate is warm or humid the icicles can take a week or more to dry.). Your icicles may take longer to dry depending on how thick they are and the level of humidity in the air. UPDATE: Over the summer I made a batch of these icicles, but because of the humid air they just wouldn't dry fast enough! I seriously waited over a week and they were still too tacky! So that got me thinking - how can I made these things dry faster? So, the past month I've been testing different ways to make the icicles dry faster - from putting them in the oven (they melted), to mixing in a little alcohol (which made them cloudy), plus many other failed attempts... but none of those methods worked. But then it dawned on me! When electronics get wet you place them in a container with white rice to dry them out! I tested this theory out this week and to my surprise IT WORKED! I used a large container with a flat bottom and a tight fitting lid, I removed the wax paper with the icicles on it from the tray and set the wax paper inside the large container. Next, I placed two small bowls with dry white rice (not instant!) inside the container with the icicles, placed the lid on the container and set aside to dry! Now it no longer matters how humid your climate is! You will create your own controlled dry climate inside the container! And if you need them to dry even faster, you can purchase food safe silica gel packets online and use them in place of the rice. When icicles are ready, slide a palate knife or other thin tool underneath the icicles to gently remove them from the wax paper. They will still be slightly sticky on the backside, but should not be so sticky that they fall apart. If they are too sticky, leave them alone and allow to dry another couple of days. As you can see in the photo, this strand of icicles is flexible and can form to the shape of just about any project you may need them for! 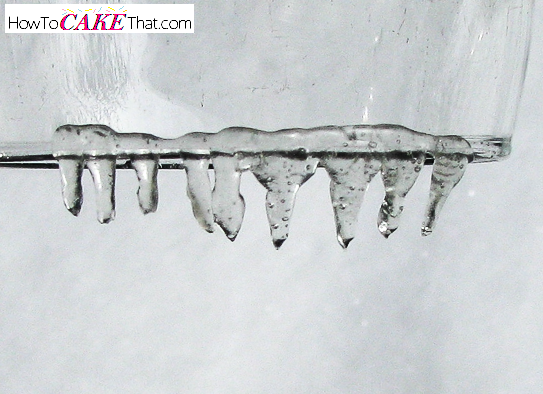 And these little icicles are sturdy enough to hold their shape even when turned upside down! To attach them to your project, use a little piping gel to glue them on, or they could be glued on with royal icing - the royal icing would make it look like snow! And there you have it! Super easy to make and easy to use clear icicles! 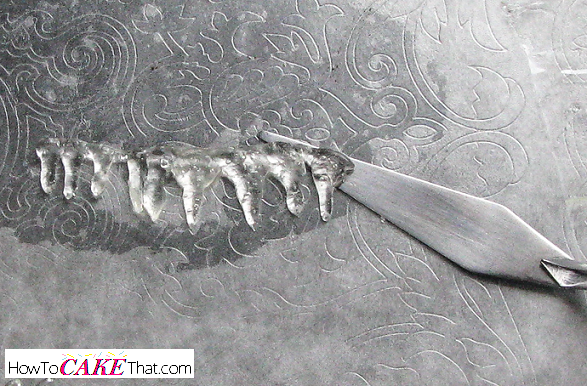 Perfect for wowing your friends, customers or even judges at your next cake competition! I hope you have enjoyed this tutorial! God bless!